Atletico Rafaela advanced to the last four of the Copa Argentina after a 1-0 win over Defensa y Justicia on Wednesday. Following the theme of low-scoring affairs from the other quarter-finals, Federico Gonzalez’s first-half strike was enough to decide the match at the Estadio Eva Peron de Junin. A corner in the 17th minute led to the goal with Defensa y Justicia failing to clear Pol Fernandez’s delivery and Gonzalez pounced, smashing the ball into the roof of the net. Just five goals were scored across the four quarter-finals with the other three matches being decided by penalty shoot-outs. River Plate – the leaders of the Argentine Primera Division – were held to a scoreless draw at home by Rosario Central and the visitors triumphed 5-4 on penalties. Bruno Urribarri missed from the spot with River’s last penalty. Argentinos Juniors will take on Rosario in the semi-finals after accounting for Estudiantes Caseros in a shoot-out. 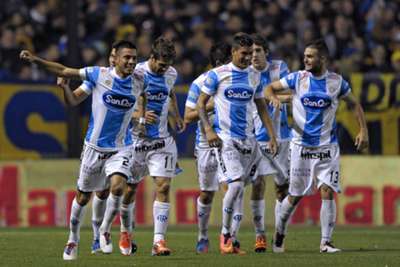 The tie finished 1-1 after Juan Riquelme scored an 88th-minute penalty to equalise for Argentinos Juniors and the second-tier club defeated Estudiantes 5-4 in the shootout. Huracan will play Atletico Rafaela in the other semi-final after they drew 1-1 at Estudiantes and advanced 3-2 on penalties.